Merkel wins in Germany but anti-immigrant far-right makes big gains. 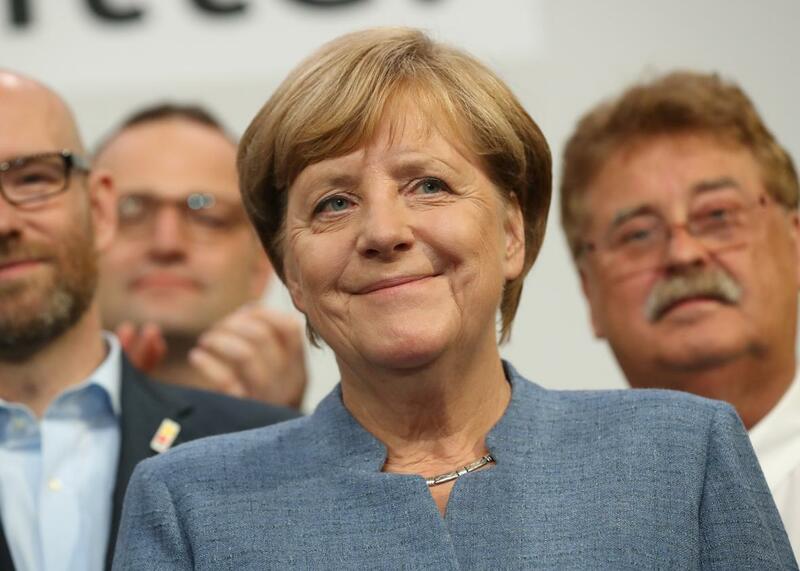 German Chancellor and Christian Democrat (CDU) Angela Merkel smiles while thanking supporters at CDU headquarters at the end of the election evening on September 24, 2017 in Berlin, Germany. As was widely expected, Angela Merkel was re-elected to a fourth term as German chancellor on Sunday but the country’s election also saw the far-right nationalists make historic gains that likely cost her conservative coalition lots of votes. In what Der Spiegel describes as a “significant shift” for German politics, the anti-immigration, nationalist Alternative for Germany (AfD) surprised political analysts by winning 13.1 percent of the votes, according to the projected results. That means that a far-right party will get into Germany’s parliament for the first time in more than half a century. If the results pan out they would represent a huge gain for AfD, which was recently polling at a paltry seven percent. Now the xenophobic party could send close to 90 lawmakers to the Bundestag. Merkel’s party was not the only one that suffered. The Social Democrats (SPD) also received its worst result since the 1940s with only 20.8 percent support in what seemed to be a clear repudiation by voters of the two parties that have dominated German politics since World War II. SPD leader Martin Schulz said the results meant the end of the “grand coalition” with Merkel, calling Sunday a “bitter day” for Social Democrats. Merkel is now likely to try to cobble together a tenuous coalition with the Greens and the pro-business liberal Free Democrats, which also surprised by receiving 10.5 percent of the vote. That party had already been part of Merkel’s coalition until 2013, when it lost all its seats in the last election. That possible three-way alliance has been widely referred to as the “Jamaica” coalition because the colors of the three parties—black, yellow, and green—match the Jamaican flag. Alexander Gauland, one of the leaders of the AfD, vowed that “we will take our country back” and that the party “will change this country.” Beatrix van Storch, one of the party’s leaders confirmed the AfD planned to hit the ground running to change the conversation. “We’ll start debates on migration, we’ll start debates on Islam, we’ll start debates on ever closer union,” she said. Opponents of the Alternative for Germany (AfD) protest on September 24, 2017 in Berlin, Germany. 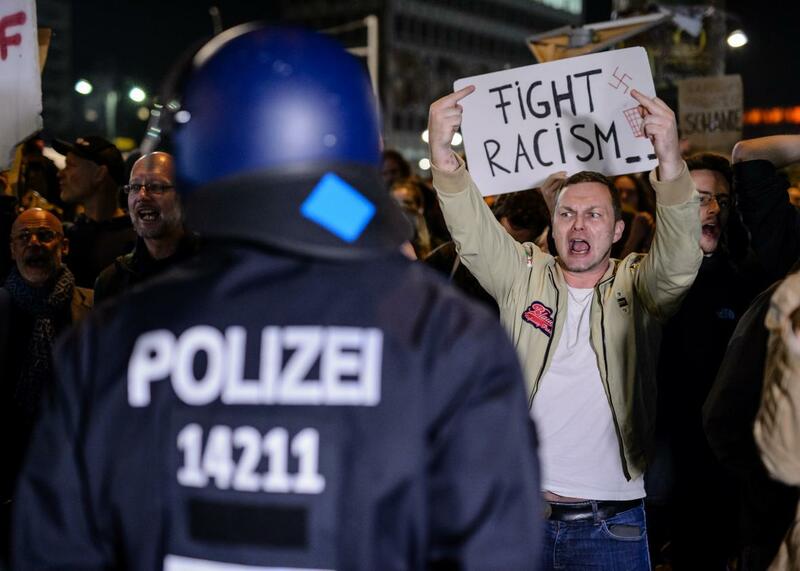 As supporters of the far-righ party celebrated in their headquarters, protesters gathered outside to express their rejection of the AfD and its ideals. “All Berlin hates the AfD,” yelled the protesters. Final results are expected early Monday morning.